Today I’m gonna take you on a little walk through our new house! It’s located on the Chesapeake Bay in Maryland, just a little under an hour from D.C. We’re thrilled to be living in this part of our great nation, as the hubs and I have yet to explore this neck of the woods (he’s from SoCal, I’m from Missouri, and together we’re from a half dozen-ish places in between). We took our first Smithsonian trek this past weekend with the girls and we had so much fun! Hopefully I’ll come away from all this with a few tips about kids and Washington D.C. But, back to the house. This picture is from the day we closed. The girls let themselves in and went exploring! 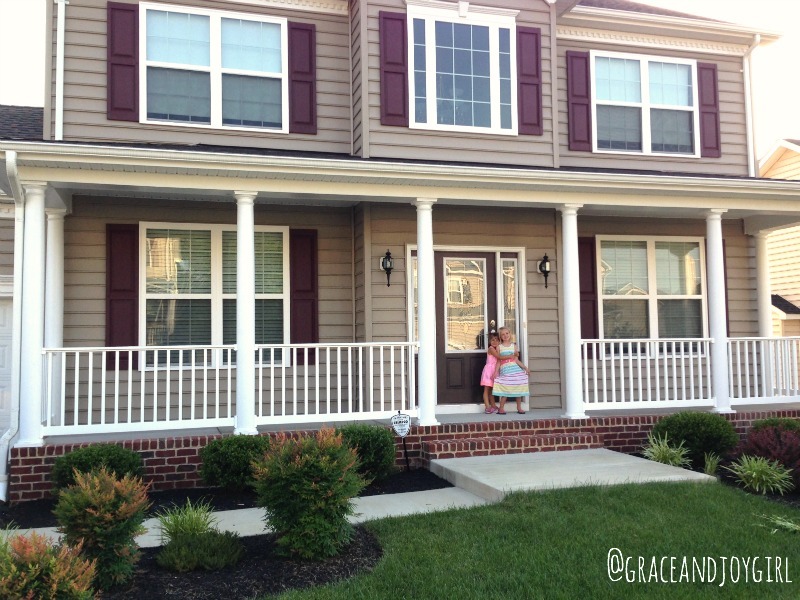 I love the traditional style of the home and the big front porch (and the touch of brick! I wanna line the sidewalk with a little more). I can’t wait to decorate for fall (without wishing my summer away). The front door isn’t my favorite. It’s a little ornate, but because the sidelights match, it will be a big expense to change it. Maybe someday. Something simple, maybe with just three little windows at the top (but I’d hate to lose the natural light in the foyer). I’d also love to change up the color scheme. I like the tan & white, but I’d love to make the door and shutters black! Like this cutie little home. I think that’s such a crisp combo. 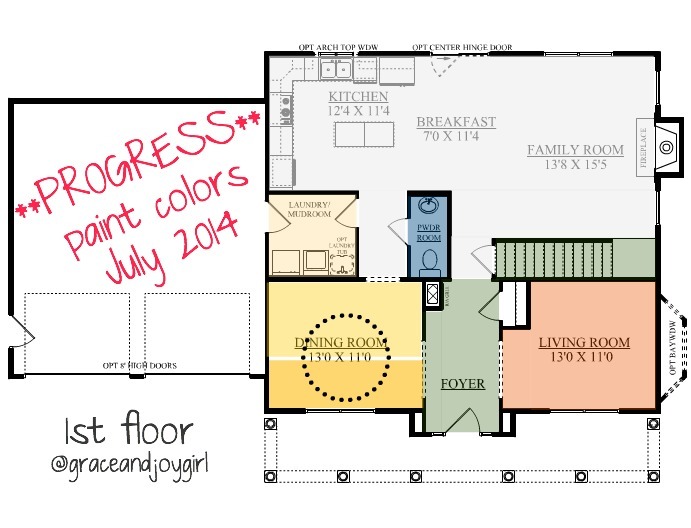 Here’s the floorplan for the main floor. We also have 3 bedrooms and 2 bathrooms upstairs and a finished basement with a family room, bedroom, and full bath (bring on the guests!!!). I’ll share those with you in the next few weeks. They’re a wee bit of a mess. I had originally decided to unpack each box as I needed it, but that didn’t really work out. Turns out the movers did a GREAT job of making sure nothing got broken, but they mixed things from all over the house in each box to get the best fit. So one day last week the girls and I dumped them all, piled everything up against the perimeter of each room, and gave the boxes away for free on Craigslist. Now there are tiny piles strewn from heck to breakfast. It’s not awesome. Here’s how it was painted when we closed. I actually LIKE green. I do. We had a green room in our Las Vegas house. But this was a little toothpaste-y for me (I actually did it some favors in this image) and not at all the look I’m going for. 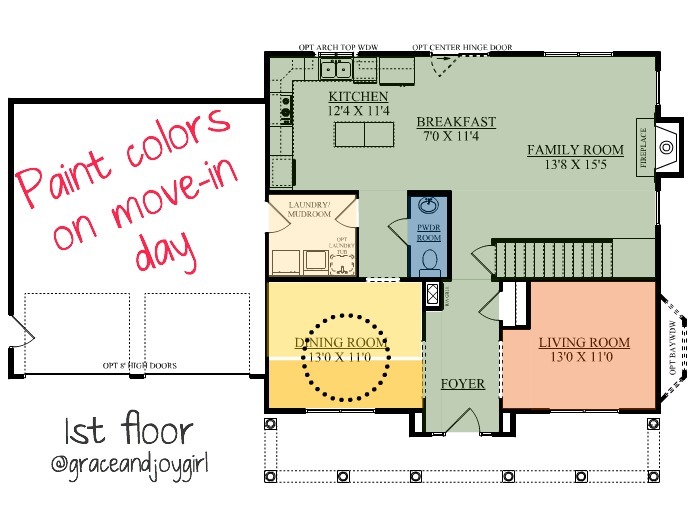 The foyer, family room, breakfast nook, kitchen, and hallways are “Restful.” Hah! Not for this gal. The Living Room is Sunset Beige, Dining room upper is Stable Hay and the lower third is Ripe Wheat. The Powder room has a coat of Frozen Pond and the Laundry is Sand Pearl. I can tell from some paperwork and paint samples that were left behind that the builder did the whole house in SW Antique White. I wish they would’ve left a little of that (well, they did. In the closets). That’s 6 paint colors in the downstairs alone. Seven if you count the closets, eight if we add the ceilings in to the mix. Also, the view when you walk in the front door is overwhelming. 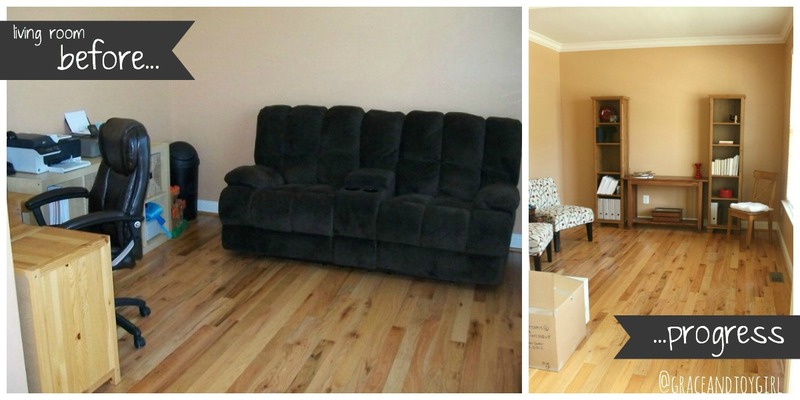 There are four visible paint colors and if you hadn’t already noticed, they don’t play nice. Nope. The color wheel has rolled outta control down here! Still not awesome, but we’re making headway. Here are a few images “befores” and a couple of progress shots. 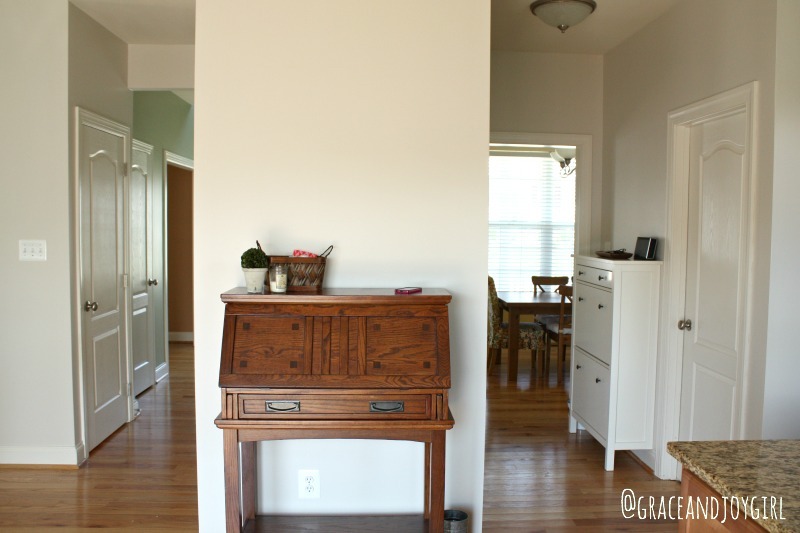 There is SO much I want to change and I’m excited to share my plan for each room (as I come up with it…the dining room has got me stumped). The living room will eventually be our music room. I am SO excited to add a piano to our home and music education into the lives of our little people. This room will probably be painted Windfresh White, but I’m hoping to do a darker, moody color on the ceiling. Maybe something with a little sheen??? Also, I’m really pleased with the hardwood floors. They aren’t exactly what I would put in myself, but I like the variation in the wood better than something that is a solid, more uniform color. 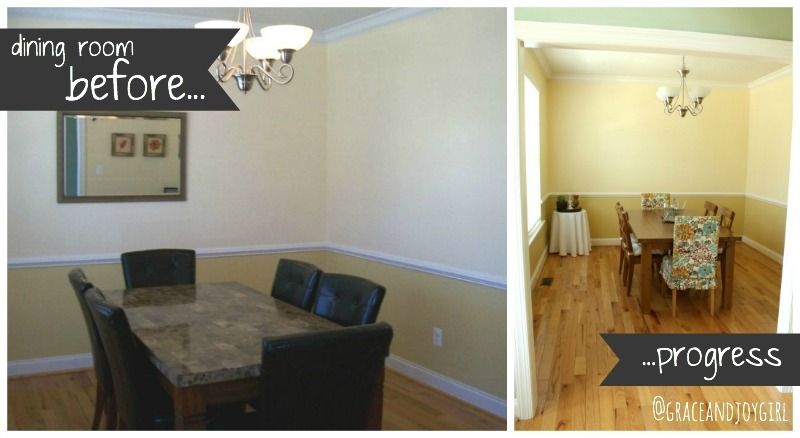 And can you tell that the realtor photos show the colors looking MUCH more muted than they do in real life?? My pics are waaaay more accurate and truly show how vivid and bright these tones are. This room already has a lot going for it. A chair rail. Check. Crown moulding. Check. The paint color. Notsomuch. But, man! This shows that a little natural light photography can make a big improvement! You also get a glimpse of that green here in my “progress” photo. Very minty. Very bright. I think I’ll go neutral with the walls here, as well. And add some big time color with great curtains. I’m trying to decide if I want to do a two-tone paint scheme (like they did, but not yellow), or add some more trim and do a faux wainscoting around the bottom. Hmmm. And this room is screaming for an awesome new light!!! I’m so excited to be back to blogging! I hope you’ll let me know if you have any suggestions for the dining room walls or the ceiling in the music room! I tend to be a bit wishy-washy, and while I don’t want to rush, I’m anxious to get change the color scheme (which looks a little like sherbet from the front door). The previous owner and I obviously had different tastes. I hope they loved living here and I know I’m gonna love making it my own! Stay tuned for Part II of the tour where I’ll show you the rest of the living space on the main floor!